I lay in layer one (L1) as usual, which can be a bit tricky when the yarn is exceptionally fluffy; just fiddle with it to get it between the pins. 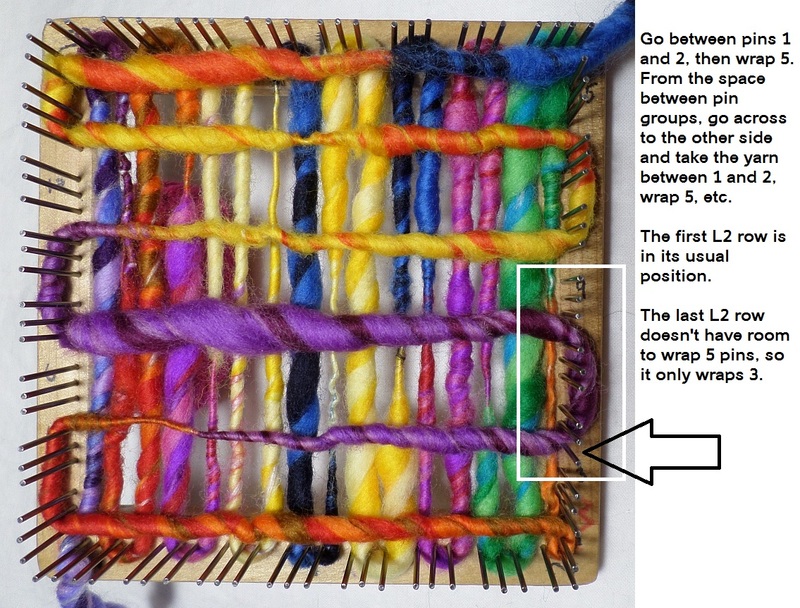 On L2, I lay in approximately every other weft row, wrapping five pins (instead of two) between rows. 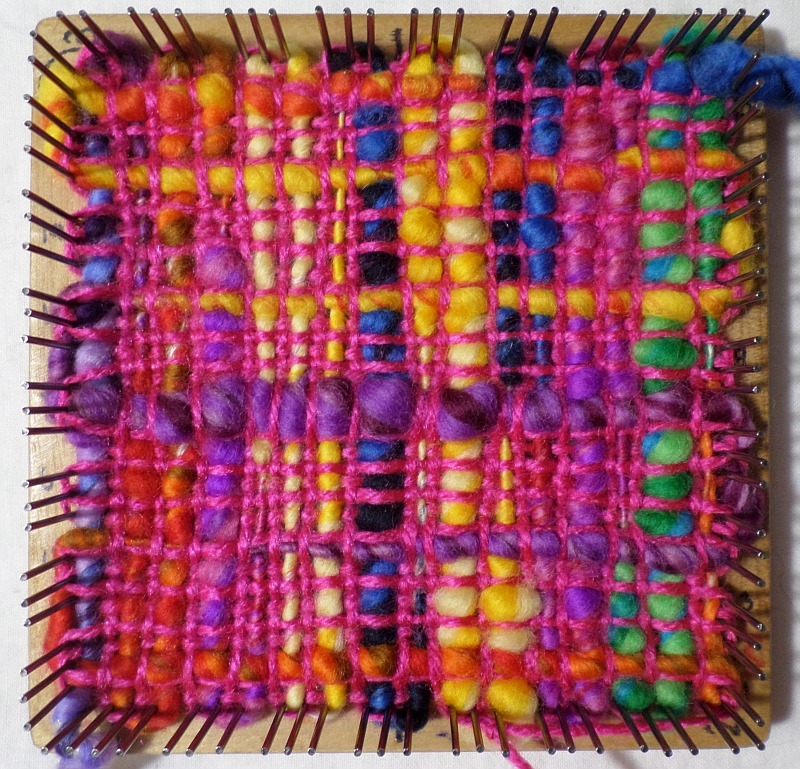 Before I show how to finish preparing the loom, the following photos show some things to consider when choosing the supplemental yarn to complete weaving the square. I figured the two Lion Brand Bon Bons were safe colorwise, but neither of them is wool, so I opted for the lavender . . . at first. I tried the lavender yarn, but decided it was too thick and competed too much with the art yarn. Instead I chose a very thin homespun yarn in a subdued color. 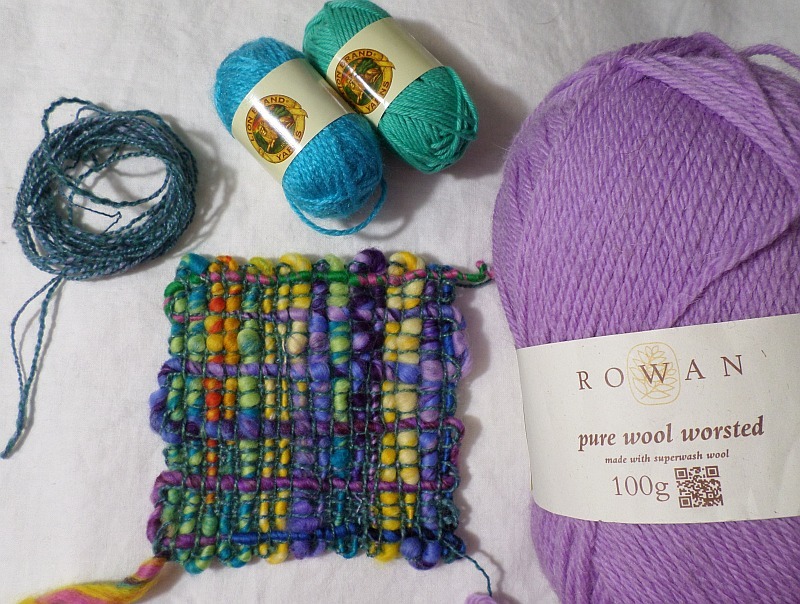 I’d forgotten that the supplementary yarn needs to be thin in order to enhance the star of the square—the art yarn. I’m really pleased with the result. 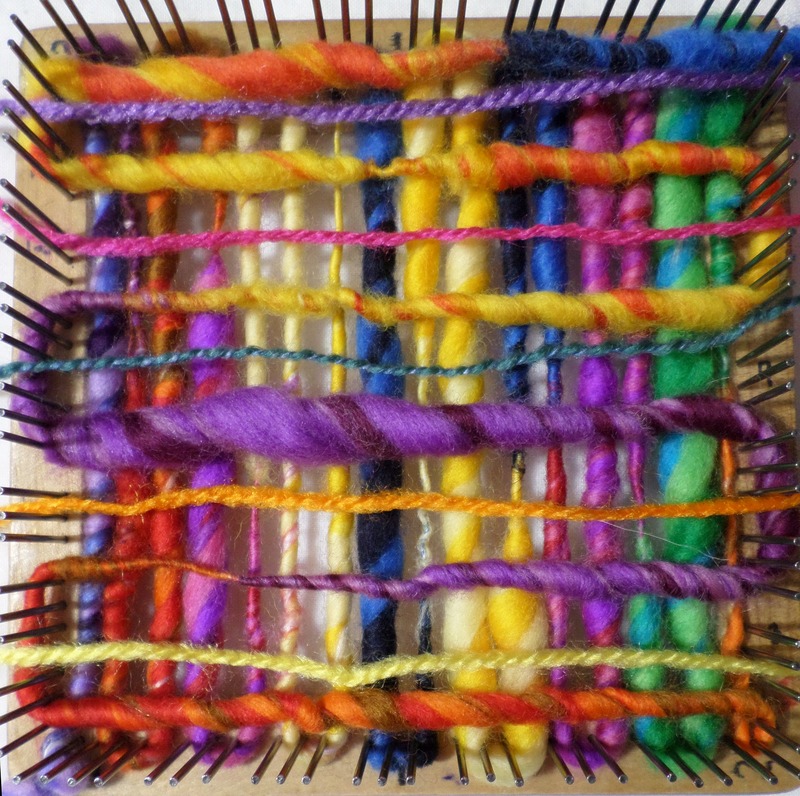 Now that the loom is initially warped (with the same art yarn), I’ve laid out several options for the supplementary warp and weft. Which do you think I should choose? 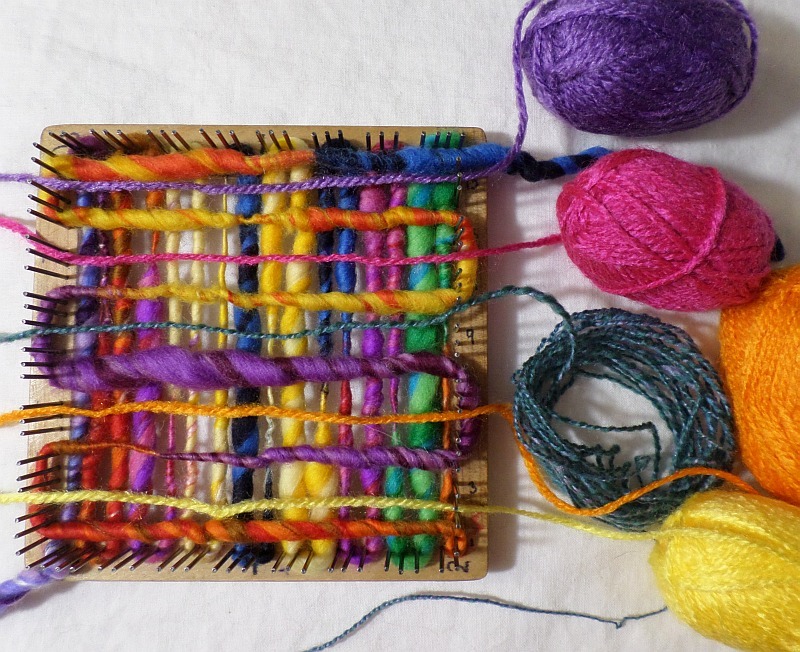 A close-up view shows that any of these yarns would work, so I have to imagine the outcome. 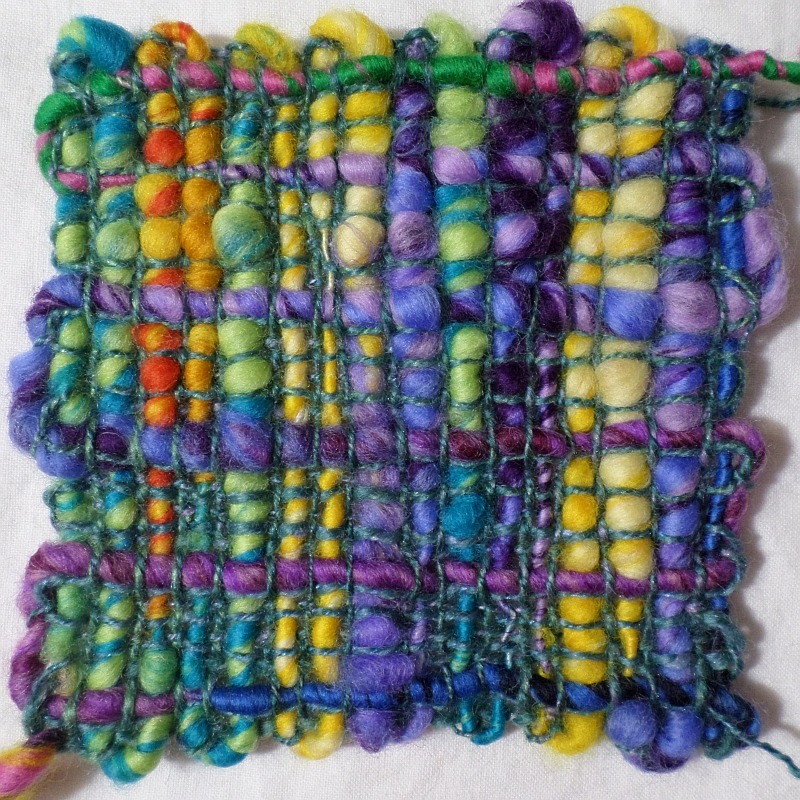 I’ve already used the turquoise; while it was a good choice for the previous square, I don’t think it belongs in this one. I’m also rejecting the yellow. It’s not a great match (a more intense yellow might have tempted me) and I think it would give the square a very pale overall look, which is not what I want. Purple is the next to go. 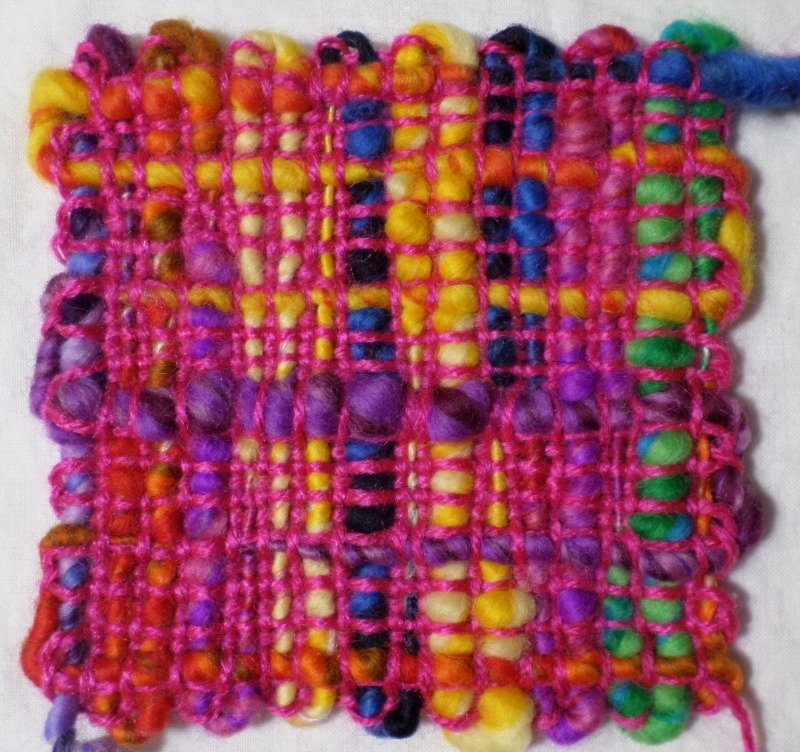 I think it would make the square look too purple; it would overwhelm the art yarn. I rather like the orange, but again, I think it will give the square a too-orange look, and won’t complement the rest of the yarn. 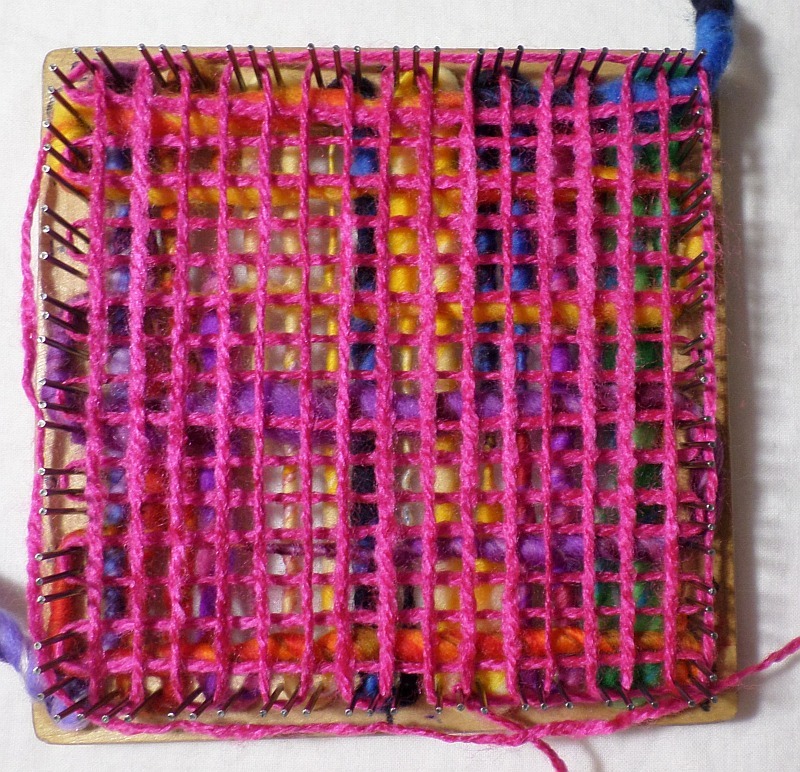 I’m going with the pink on this square. 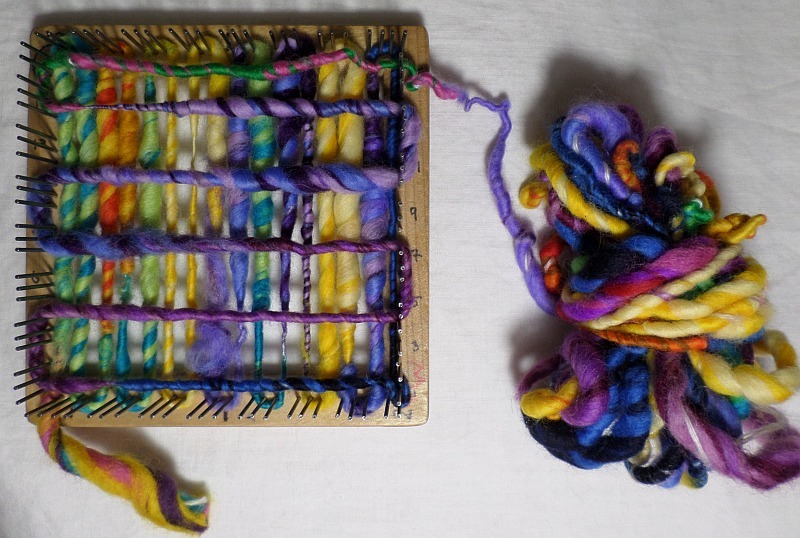 I think all the art yarn colors will be enhanced by this. I tied the pink yarn to a lower edge pin and warped L2 as usual. 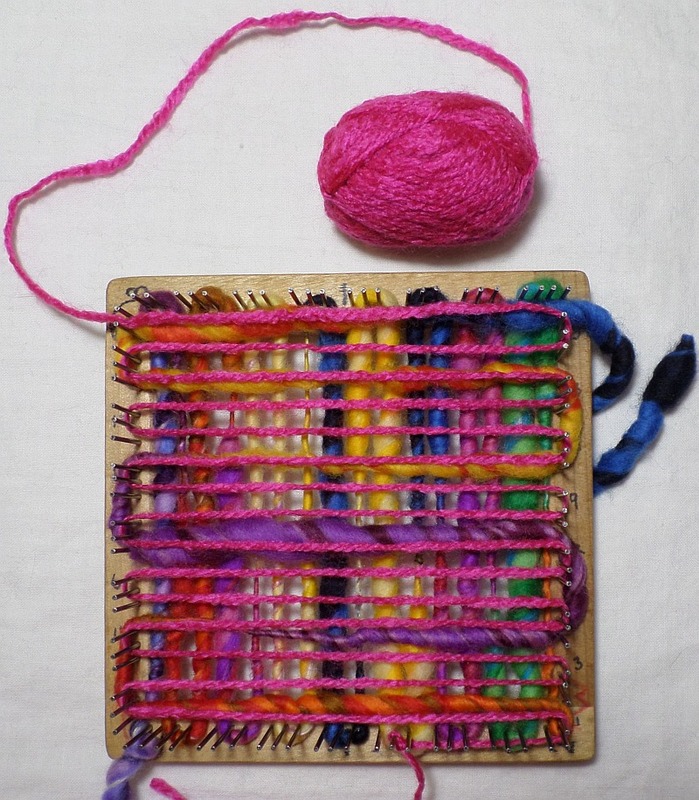 Yes, some of the rows will end up with a weft of pink plus a weft of art yarn. 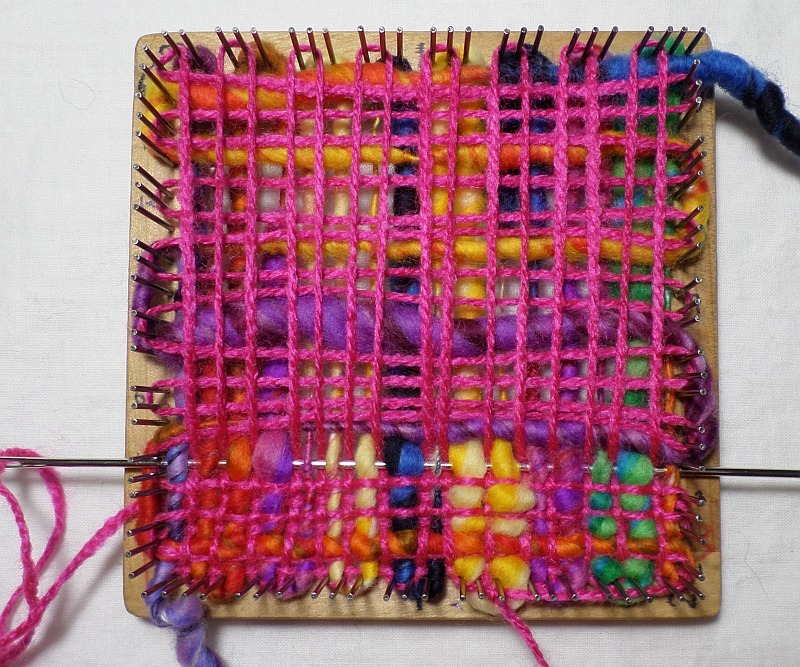 As you weave, exit each row UNDER the long L2 loop outside the pins. Enter each row through the outer loop as usual. 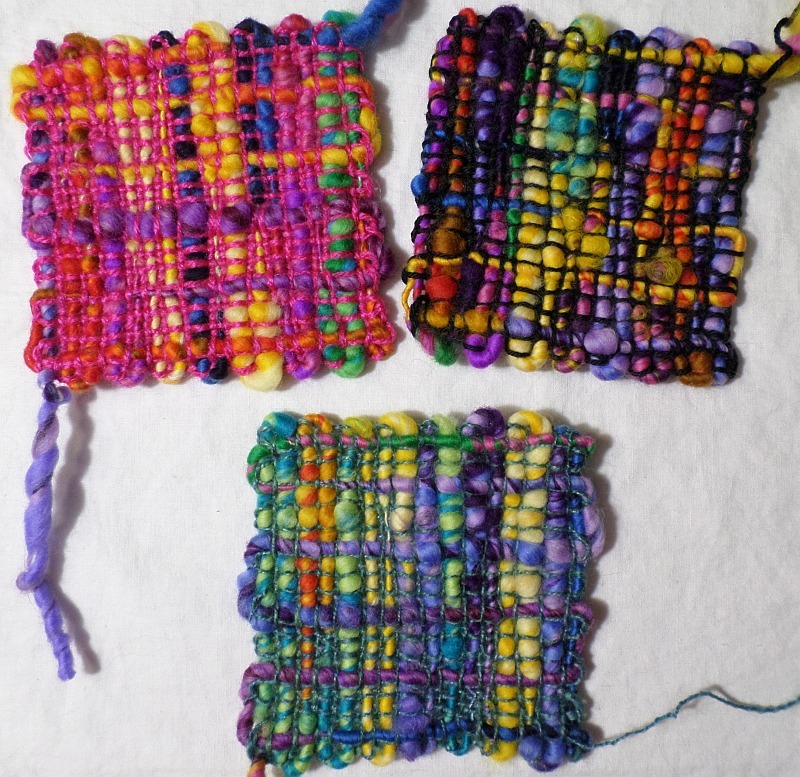 A comparison of three squares that all used the same art yarn. Each looks nice; each is different. In case you’re wondering about the art yarn I plied last night . . . 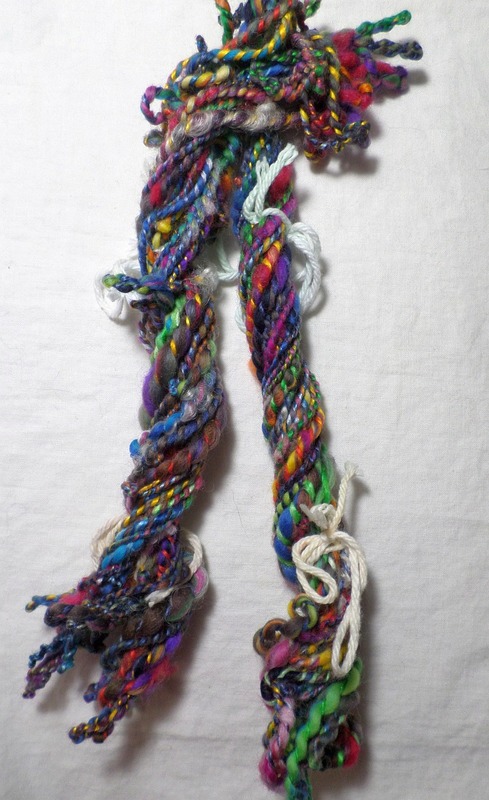 The new skein of art yarn is very TWISTY! I haven’t wet finished it yet, but I suspect that overall it will be a bit slimmer than my first art yarn. It will be interesting to see if I want to use it by itself in L2—using supplementary yarn only in L3 and L4.